It sure has been a fun filled summer and I hate to see be over so soon! I have had a lot of adventures. It started out with our family vacation to the beach house in San Diego. I enjoyed that very much. Spending a week with the WHOLE family. Even though the weather was not very good we still managed to ge a little sun, go to six flags and just enjoy each others company. We also got creative and tried to see how many people we could get into the big giant bath tubs that the beach house has...that was a fun time! I had the opportunity to go skydiving. I had been wanting to go skydiving for so long and I can fianlly say I have done it. 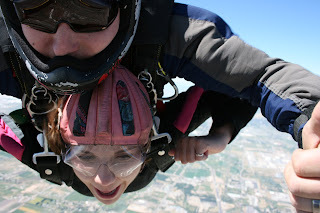 It was super scary at first and I even wanted to back down and not do it, but as soon as I jumped out of that plane I was so glad I didn't back down. I wish it was not so expensive or else I would do it again for sure. I have been down to St.George a few times to spend time with Kim and her family before they moved to Indiana....sad day I am going to miss them very much! I also attending the Hannig family reunion. As well as went down to vegas with my little sisters. We went shopping(I didn't buy anything because I am just a poor college student), hung out, and just had fun together. Last weekend a few of us went to Flaming Gorge for a camping/water rafting trip. 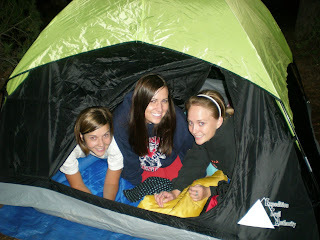 Kara, Tina and me built our own tent all by ourselves. We were quite proud of it. The trip was pretty fun even though it was raining and our tent was not water proof! I am going to lake Powell on Friday and I can't even wait. I have been waiting for a Lake Powell trip all summer and it is actually happening. When I get back I will have to tell all about it!